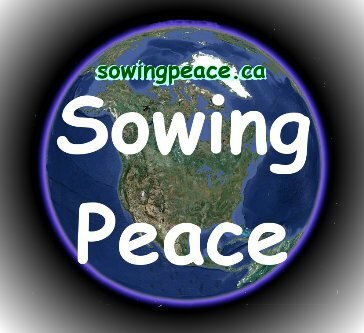 Sowing peace is taking a new direction. I am now using literature to promote peace. Check out The Sowing Peace Home Page for more details. My first book, "THE ALTERNATIVE," takes a look at the causes of war and suggests an alternative. Ignore Him and He’ll go away! Maybe? Today’s society seems to be snubbing God. Why is that? Many do not believe there is a God and the ones that do cannot agree on who He is. A myriad of beliefs have sprung up and the manifold interpretations of God’s word are usually self serving. As a result there is no clear picture of the Divine Being and the distorted pictures of Him are met with disbelief. In the fourth Sura of the Qur’an we find the following. “They would fain that ye misbelieve as they misbelieve, that ye might be alike; take ye not patrons from among them until they too flee in God's way; but if they turn their backs, then seize them and kill them wheresoever ye find them, and take from them neither patron nor help,” Many read thus far and it is used by the enemies of Islam to show that the Prophet was a bloodthirsty tyrant. The worst enemies of Islam are those who claim to believe but commit acts of terrorism based on these words out of context. At the time Muhammad was on the earth a he needed to be a military as well as spiritual leader in order to protect the people. He was teaching military strategy here and in effect was saying, “Don’t wait for your enemies to attack but seek them out and destroy them before they have a chance.” This was a very hard stance that was necessitated by the age in which it was revealed. However for those with a longer attention span Muhammad continued so His meaning would be clear. “... . But if they retire from you and do not fight you, and offer you peace,- then God hath given you no way against them.” Thus it is clear that Muhammad gave permission to defend oneself against proclaimed enemies and taught sound military strategy for dealing with this. Yet the option for peace is always the preferred option. Now the present day comes along and we see the separation of government and religion. If someone wants to pray to God in a school that is a big taboo. No mention of God is to be made in any institution funded by the government. God has taught love. He has taught us not to kill. He teaches us to accept others and to prefer them over ourselves. Why do we not want these principles taught in the schools? The reality of it is that the religionists themselves have put up stumbling blocks by interpreting the Words of God to serve their own purposes. God teaches us that we should love all mankind. The religionist interprets that to mean only those who agree with his principles. True men are those who agree with the principles as they understand them and anyone who has another understanding must be shunned and hated. God says “Thou shall not kill.” The religionists interpret that to mean we must go to war and eliminate all who do not agree with our own interpretation of God’s word. We should prefer our neighbor over ourselves is a teaching that is meant for others who must prefer us before themselves. The religionists firmly believe in their own superiority and all others must bow down in awe before their infinite and perfect knowledge. In the Tablet of Ahmad we read, “Be thou assured in thyself that verily, he who turns away from this Beauty hath also turned away from the Messengers of the past and showeth pride towards God from all eternity to all eternity.” All God’s messengers were the embodiment of Truth. When we reject Truth we reject them all. Scientific discovery is the investigation of Truth. We come up with theories and then try to prove them. If a theory cannot be proved, or if it is proved as wrong, it is discarded. In the process new theories are developed. The scientific approach leads to a greater understanding of what is truth. Unfortunately many religionists do not want to use the scientific approach and insist that religious concepts must be accepted without proof no matter how illogical and ill conceived they may be. It is now, when mankind has turned a cold shoulder to God that we need His instructions the most. However we need to use the scientific discovery model to determine what is Truth. False teachings and claims must be abandoned before they can to more harm. The true, common principles laid out in all religions must be investigated. Then we will see that great gathering promised in Luke Chapter ten. 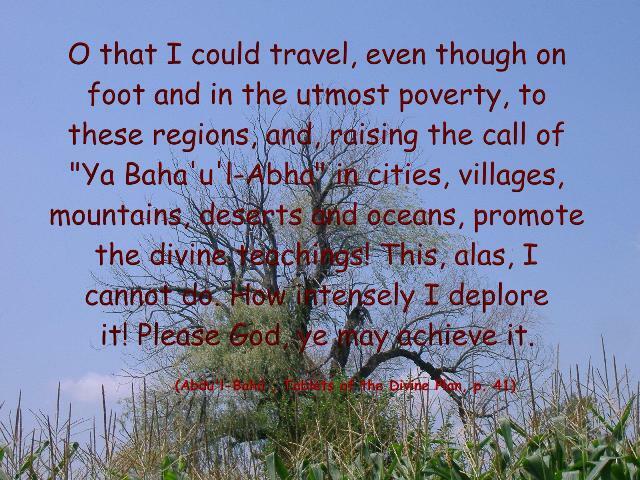 'Abdu'l-Bahá laid out some principles when he talked in London, England in 1911. The third and fourth principle apply most to this discussion. Thirdly: Bahá'u'lláh taught, that Religion is the chief foundation of Love and Unity and the cause of Oneness. If a religion become the cause of hatred and disharmony, it would be better that it should not exist. To be without such a religion is better than to be with it. Fourthly: Religion and Science are inter-twined with each other and cannot be separated. These are the two wings with which humanity must fly. One wing is not enough. Every religion which does not concern itself with Science is mere tradition, and that is not the essential. Therefore science, education and civilization are most important necessities for the full religious life. We may think that God will go away if we ignore Him, but I am not sure I would want to live in a world devoid of God. What is needed now is True spiritual instruction and there is such courses being taught around the world. Look up the Baha’i Faith in your area to learn more. Labels: Turning away from God. separation of Science and Religion. government and religion. though a search so hard and long. And to help me write this song. I can be nothing more. To have a perfect day. I will strive for eternity. And continue on my way. Though it will always elude. What a horrible sinner I am. That Jesus came to save sinners. We are forgiven by the grace of God. Though that may seem kind of odd. I would lose the grace of the Lord. Is more than I can afford. I hate labels. Labels limit, divide, marginalize and exclude. One labels himself “Christian” and it means he is not a Hindu, Buddhist, Jew or Muslim. One is labeled “White” and it means he is not Black, Yellow, Red or Brown. One is labeled Canadian and it means he is not French, German or Spanish. Labels are used to categorize. This one belongs with this group and therefore is excluded from all others. Some wear their labels proudly feeling that their group is superior to all others. They are glad to separate themselves from the less fortunate, the ungodly and the less intelligent. When their superiority is challenged, wars break out. If all challengers are killed, surely their own superiority will be maintained. I hate labels. Labels cause hatred, violence and wars. However there is one label that I wear. Not because it divides me from others, but because it unites me with the whole world. Not because it categorizes me as a minority, but because it identifies me with the largest majority possible. It identifies me with all humanity. Not because it makes me feel superior to others but because it makes me feel I am a part that is united to all. Not because it excludes me from all other groups but because it joins me to all other groups. I hate labels because they are viewed as exclusive, but I wear one that is inclusive. I wear it reluctantly because many see labels as exclusive, so I must explain that the label I wear excludes no one. The label I wear does not divide the races of humanity but sees all as members of the human race. We are all part of the garden of humanity with its many coloured and beautiful flowers. The label I wear does not identify me with one nationality but proudly proclaims that I am a world citizen. I love my sovereignty because it includes all and my love for all can tolerate no hatred for anyone. I may not like your habits or your deeds, but you, like me, where created by One God. Although we may not be perfect we can all strive to be better. We can learn from each other and all become the best world citizens we can be. The label I wear does not exclude me from any religion. In fact it recognizes that all religion comes from God. Muslim, Christian, Jew, Buddhist. Hindu or any other can join hands and strive to unite all into one fold. The day when there will be One Fold and One Shepherd has arrived and we are now being called by this healing message. The Divine Physician has arrived that can heal the world of every disorder. Each one of us is unique. We each have characteristics that make us different from all others. These differences are not to be abhorred. They should be embraced. We are made to work together and as parts of a well tuned machine, we all have our own roles to play. The machine only works when we all work together. The orchestra only sounds great when all a playing from the same page. We are all part of the Divine Symphony that has the power of unite the world. I don’t have to see someone building a house to know that the house had a builder. I don’t have to know anything about a cell phone to know that it was designed and manufactured by someone or a company employing many. I therefore did not need to see this magnificent universe set up with infinite numbers of atoms, each one its own solar system with electrons circling a nucleus in perfect balance just as the planets circle around an infinite number of stars, to know that a very Wise and All-Powerful Force must have been responsible for creating such a wonderful piece of machinery. The intricate parts from the tiniest electrons to the largest galaxies all set in perfect balance prove the existence of a Superior Intelligence. We learn in school how the kinetic energy of a moving object must be in perfect balance with the gravitational force of a larger object to stay in orbit around it. Scientist have been able to keep satellites in orbit for years by making exacting calculations, but God puts larger satellites into orbit with such exacting standards that they remain for eternity. No one knows how long the Earth has completed its annual orbit around the Sun. Evidence has shown that there has been life on Earth for millions of years before mankind inhabited this planet. Gradually we have become aware of other stars and other planets, but this tiny electron circling the nucleus of the Sun is the only home we have known. This little speck of dust is where every great civilization has developed and grown. The evolution of politics and the advancement of humanity has all taken place on this negligible planet as it whirls and spins around a medium sized star. Thus creation becomes the ultimate proof of a Creator. Labels: Baha'i Christian Islam atheist, Baha'i Faith, Baha'u'llah, Christian, Divine Inspiration, Peace between religions. Many may believe that global prosperity is impossible, and with the current mindset it very likely is, but if we change the way we think, we can do it. The problem is that the world has become very competitive. Competition in itself is not bad, but carried to excess, it leads to greed. Greed is the main obstacle in the way of prosperity for all. Our competitive mindset leads us to believe that we can win and take more than our share. The problem with having winners is that this means we must also have losers. When one gains excess, another does without. We saw an extreme example of this in the first two centuries of USA history. This glorious nation carved out her destiny on the backs of slave labour. The competition went to the extreme level were the winners owned the losers and had the power to force them to do whatever the winners wanted done. Although this led to the strengthening of the slave class, the master class became weak and ignorant. As a result, the society overall was delayed in its development. This is proven by the fact that overall prosperity in the north, were slave labour was not used, was greater than in the slaveholding south. Labels: competitive society, cooperative society, global peace. It is with gratitude, honour, and thanks to George for asking me to be a guest blogger on London World Peace Forum. Is the world becoming more peaceful? For who is it becoming more peaceful? What things/forces are keeping us from achieving peace? How do you approach peace, either at an inner or outer level or at the individual or world level? Why do we want peace? Is peace a positive or negative force? Is peace tangible or non-tangible ? How do we achieve it? What are the thought's of others on peace? The thoughts of past leaders and thinkers? The fugitive Slave Chapel is now home. go to www.fscpp.ca the find out how it got there. ©2017 George McNeish. Powered by Blogger.